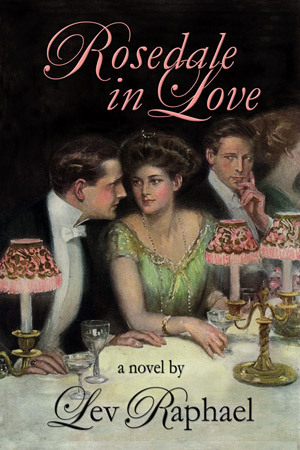 In the glittering world of money-mad 1905 New York City, Jewish financier Simon Rosedale plans to force his way into high society through marriage and has his eye on Lily Bart. One of the most beautiful women in the city, Lily is a down-at-heels aristocrat plagued by gossip and might be vulnerable to his proposal. With his money and her style and connections, he can rise to the top—but will she lower herself to marry a Jew? Could such a marriage heal Rosedale's secret shame, and will Florence Goodhart, the cousin who adores Rosedale, help or hinder his plans? Written in a period voice, Rosedale in Love audaciously revisions Edith Wharton's beloved classic The House of Mirth, offering readers a timeless American story of greed, envy, scandal, love and revenge. Lev Raphael is a prize-winning author, reviewer, and blogger who has published 19 books in a wide range of genres and been translated into a dozen languages. A former student of famed Wharton biographer Cynthia Griffin Wolff, Raphael has been reading Wharton for decades. He's written a highly regarded biography/critical study of Wharton as well as a comic mystery delving into the politics around her reputation. "Richly textured and darkly witty, Rosedale in Love explores the inner life of outsiders, to whom the hidden give-and-take of high society is a language to be struggled with, for whom external wealth and inner impoverishment go hand in hand. Lev Raphael catches the subtlety of Wharton’s original, and enriches her exploration of a story in which love pulls against ambition, and shame is a daily taste in the mouth." "Lev Raphael brilliantly captures an American era of fabulous wealth and fatuous prejudice while giving Simon Rosedale the nuance and complexity that the otherwise-masterful Edith Wharton, blinded by the mindless Anti-Semitism of her day, failed to do. In turning Wharton’s careless caricature into a memorable multi-dimensional being, Raphael makes our sympathies shift in wonderfully startling ways. Beautifully written and absolutely absorbing." "When The House of Mirth is revisited from Simon Rosedale's perspective, the Gilded Age gives up still more of its secrets. Lev Raphael explores many of the areas in which the period was over the top—from high fashion to high finance, from gastronomy to interior decoration—and the mix provides a great summer read." "Happy 150th Birthday, Edith Wharton!" © Lev Raphael. Web site by interbridge.